I hope everyone had a wonderful long weekend & Canada Day. There is more cause for celebration, as four out of five Western bluebird pairs in the Cowichan Valley have re-nested. 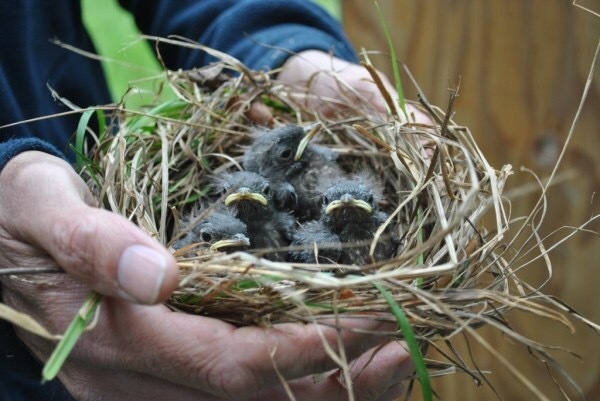 As of today, all 4 nests have hatched, producing at least 16 additional nestlings to the population. In addition to observations in the field, the use of remote wildlife cameras at the mealworm feeding trays, has allowed us to confirm that most fledglings from the first clutches of the season are healthy and present. Surveys to look out for additional bluebirds are ongoing, as well as nest checks, and nest box maintenance. The trail monitors are still out looking for bluebirds and collecting nesting data on the variety of species using our nest boxes. As field work is slowing down, Genevieve & I have been transitioning into the grant writing & long-range planning phase of the season. In other exciting news, Julia Daly, our project liason in Victoria, has recently been investigating a male western bluebird sighting. Although we’re unsure of this male’s origins at the moment, it is banded, meaning it came from either the Cowichan Valley or San Juan Island. This is the second bluebird seen in the Victoria area this season, and Julia has plans to put up more nest boxes there this summer. Additionally, a 2017 juvenile female from the Cowichan Valley has been found nesting on San Juan Island with a local San Juan Island male, demonstrating yet again the connectivity of the population between these regions. Click here to learn more about the San Juan Preservation Trust’s Western Bluebird Reintroduction Project. Please check the CVNS Facebook page for on-going updates on the project, and if you have any potential bluebird sightings to report, please contact us by mailing cowichanbluebird@gmail.com or by calling Hannah’s cell phone at 250-740-5076.